The Mixed Record Of Nobel Peace Prize Winners : Parallels The Nobel Peace Prize Committee acknowledges that its choices are based on both achievements and aspirations. Sometimes those aspirations are realized, and sometimes not. 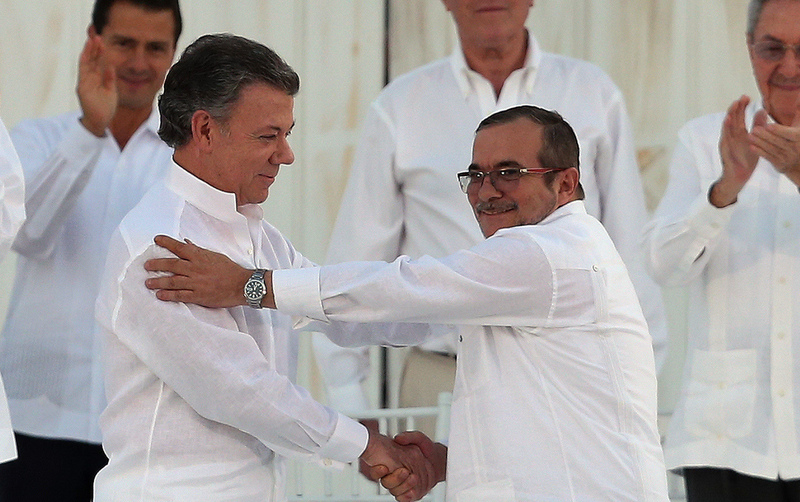 Colombia's President Juan Manuel Santos (left) shakes hands with the top commander of the FARC rebels, Rodrigo Londono, after signing a peace agreement on Sept. 26. Santos was named winner of the Nobel Peace Prize on Friday. Picking the Nobel Peace Prize winner has always been more art than science. Mahatma Gandhi was nominated five times but never won. In choosing Colombia's Juan Manuel Santos on Friday, the Norwegian Nobel Committee opted for a president who has wound down a half-century of fighting by reaching out to the FARC rebels. But the peace deal signed by Santos and the rebels on Sept. 26 was narrowly rejected in an Oct. 2 referendum by Colombian voters. It's not clear what will happen next. Santos and the rebels say they are still committed to peace and there are no signs that fighting is about to be reignited. But there are no guarantees. The Nobel Committee said this year, as it's said in the past, that the prize is both for achievements and aspirations. "Our aim is to honor the work that has been done ... and to tell to the Colombian people that we encourage you to go on through all the parties that have participated in this process," said the chair of the Norwegian Nobel Committee, Kaci Kullmann Five. In perhaps the most prescient move by the committee, German pacifist Carl von Ossietzky was chosen in 1935 for writing about the secret rearmament program in his country. Some critics said the selection was interference in the politics of Germany, where Ossietzky had been imprisoned. Adolf Hitler was outraged and barred not only Ossietzky, but all Germans, from receiving a Nobel Prize. Ossietzky was not allowed to collect his prize and died in a prison hospital in 1938. 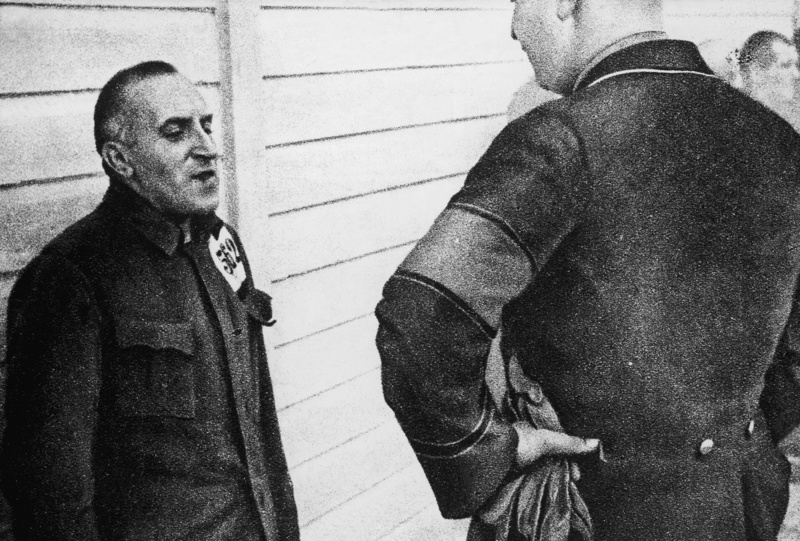 German writer Carl von Ossietzky is shown with a guard at a Nazi prison camp where he was being held in this undated photo from the 1930s. While in prison, he won the 1935 Nobel Peace Prize for his writings on Germany's secret rearmament program. Adolf Hitler was furious and decreed that no German could receive a Nobel Prize. Von Ossietzky died in a prison hospital in 1938. The 1993 prize went to South Africa's Nelson Mandela and F.W. de Klerk, who had just negotiated a deal to end apartheid amid ongoing violence. But the first all-race election would not be held until the following year, and there were fears that the conflict could escalate and derail the agreement. But Mandela won the election, the political violence ended and apartheid was relegated to history. The Nobel committee took a similar approach the following year, 1994, when it honored Palestinian leader Yasser Arafat along with Israeli leaders Yitzhak Rabin and Shimon Peres. The prize was a recognition of the interim agreement the two sides signed in 1993 and encouragement to work out a permanent peace. But the conflict remains unresolved to this day, and Peres, the last survivor of the three prize winners that year, died just last week. In one of the most controversial choices, American Henry Kissinger and North Vietnam's Le Duc Tho were named recipients in 1973 for negotiating an armistice in the Vietnam War. Two members of the Nobel Committee resigned in protest. Le Duc Tho refused to accept the prize, saying the U.S. violated the terms of the armistice. The deal led to the withdrawal of U.S. combat forces, but the war was ultimately decided on the battlefield as North Vietnam defeated the South, taking over the capital Saigon, now Ho Chi Minh City, in 1975. President Obama received the Peace Prize in October 2009, less than nine months after assuming office. The committee cited "his extraordinary efforts to strengthen international diplomacy and cooperation." But critics said it was politically motivated, describing it as a rebuke to the wars waged by Obama's predecessor, George W. Bush, and support for Obama's pledge to end U.S. involvement in Iraq and Afghanistan. Obama removed the U.S. combat forces from those two wars and has sought to reduce the U.S. military footprint. But he has also expanded the use of drones while bombing seven separate countries. And with just three months left in office, the U.S. military remains actively engaged in the wars in Iraq and Afghanistan, as well as Syria, carrying out airstrikes most every day in all three countries. The committee has the option of not awarding a prize, which has happened more than a dozen times since it was first given in 1901. The last time no Peace Prize was Awarded was 1972.